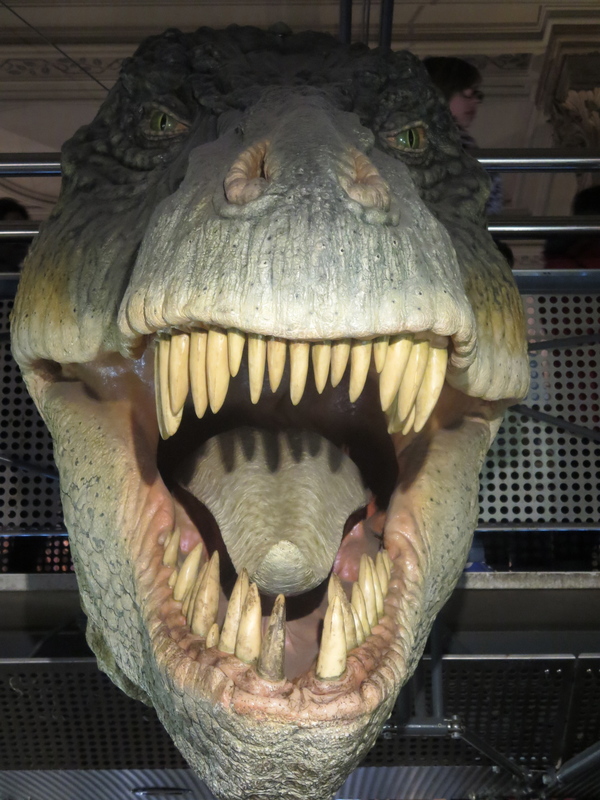 On Easter Sunday we took the kids to see the Dinosaur exhibition at the National History Museum in London. It was all out excitement for 7YearOld and LittleBoy with Babygirl along for the ride. Excitement because 7YearOld was finally going to visit the place that Andy works (Andy’s Dinosaur Adventures on Cbeebies!) Excitiement for LittleBoy because we were going to travel ON A TRAIN. Major excitement factor. Daddy and I thought that it would probably be a good time to go. Firstly, who goes out on Easter Sunday? And secondly, the weather was raining after 2 weeks of sun; wouldn’t everyone just rather stay at home? Ahhhh, that would be a big no. ALL of the UK (who had children) were at the museum. Or at least queueing to get in. When we arrived the wait time was 2 hours just to get in the museum and the queue once inside was another hour for the Dino exhibition. Aggghhhh! Luckily also the queue to the Dino’s was moving fast and we only waited for 15 mins. All the while the boys googling at the huge brontosaurus skeleton that we snaked around on our way along the queue. 7YearOld is a Dinosaur expert thanks to watching Andy and his adventures. Calmly he knowledgeably explained about each exhibit. I was particularly impressed when he corrected my exclamation, “oh look, there is a T-Rex”. No Mum said he, that is a Allosaurus as a T-Rex has two claws and the Allosaurus has three! All in all it was a great day out and I recommend it. But do what you can to beat those queues! Here are some pictures I took during the day. This entry was posted in Holidays and tagged Dinosaur Exhibition by Mamasim. Bookmark the permalink. Sounds just like my son. Next Simone, is learning all the Pokemon off by heart!